Don’t stress about what you are going to serve your family for dinner tonight. 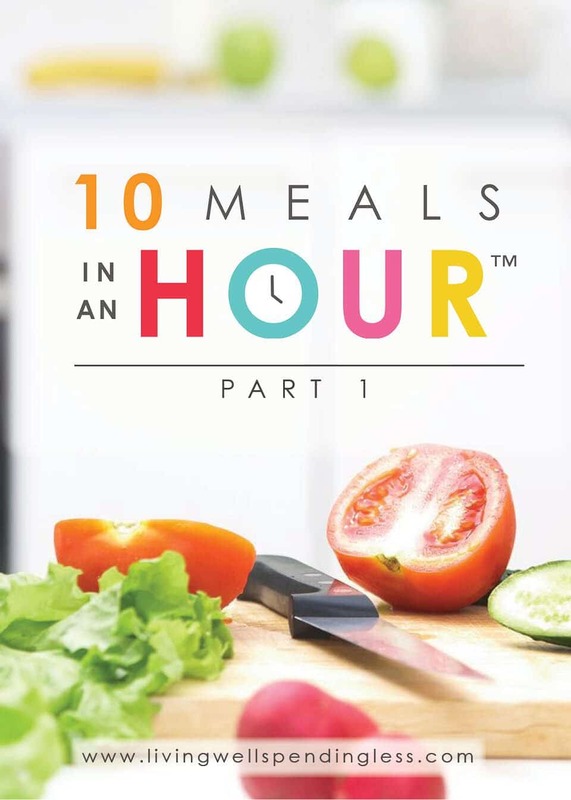 With just a bit of planning, you can create 10 meals for your family in just 1 hour. GET MY MEAL PLANS NOW! GET MY MEAL PLAN PRINTABLES! Prep your bags—either print labels using these ready-made printable labels or use a permanent marker to label each bag with the name of the recipe, date prepared, and cooking instructions. DO NOT SKIP THIS STEP! While you might think that you’ll remember what is in every bag, I promise you will forget! Drain & rinse kidney, pinto, and black beans; set aside. Prep Quick & Easy Taco Soup using instructions found here. (Use only 1 cup or about half of the already chopped onion.) Divide mixture into 2 freezer bags, press out excess air, and seal well. Place bags in refrigerator. 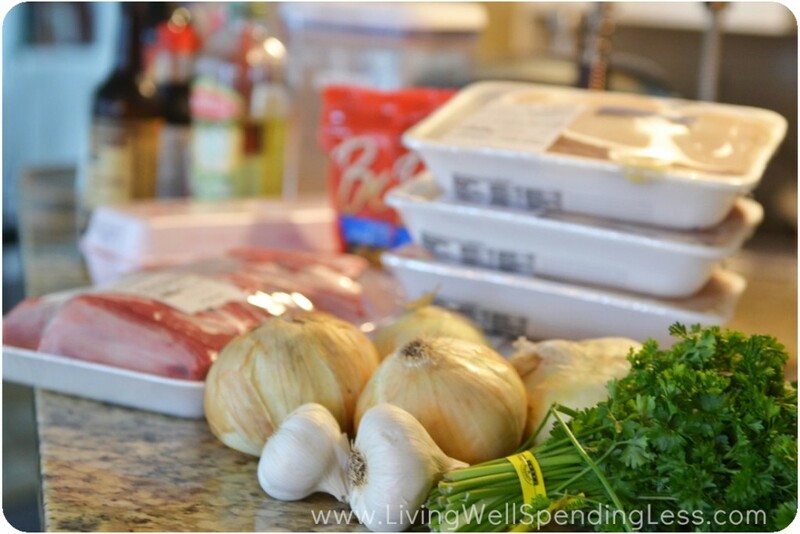 Prep Oh-So-Easy London Broil using instructions found here. (Use remaining chopped onion.) 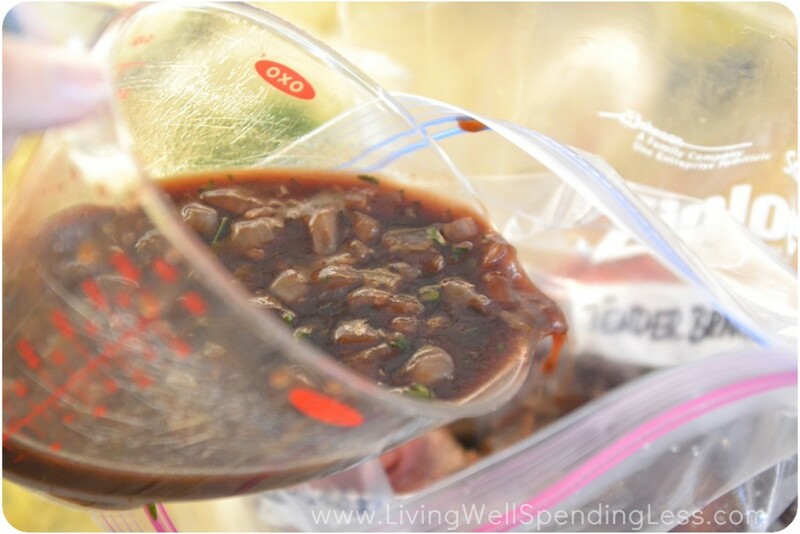 Place meat into 2 freezer bags and cover with marinade, then press out excess air and seal well. Place bags in refrigerator. Prep Orange Glazed Pork Chops using instructions found here. Place meat into 2 freezer bags and cover with marinade, then press out excess air and seal well. Place bags in refrigerator. Prep Honey Lemon Garlic Chicken using instructions found here. Place chicken into 2 freezer bags and cover with marinade, then press out excess air and seal well. Place bags in refrigerator. Prep Creamy Italian Chicken using instructions found here. Place chicken into 2 freezer bags and cover with cream cheese mixture, then press out excess air and seal well. Place bags in refrigerator. Once all prep is complete, place all bags in freezer until needed. After you’ve made your meal plan for the coming week, consider setting an alert on your phone to remind you to take your bag out to thaw the day before you plan to make it! And that’s it! Pretty darn easy right? Ten delicious freezer meals in about an hour–does it get any better than that? You can check out the rest of our 10 Meals in an Hour posts here. Have you ever tried freezer cooking? What are your family’s favorite freezer friendly recipes? P.S. 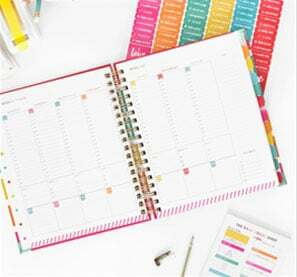 The new Living Well Planner™ has a SIMPLIFIED MEAL PLANNING section. It gives you the option to plan just one meal a day, or all three. Check it out HERE. OMG, this is SO AWESOME! I’ve tried freezer cooking in the past but all the recipes seemed to require a lot of cooking. It literally took me all day! I can’t wait to try this! Thank you so much!!!! It wont let me open the links to print. What if I don’t have fb because someone harasses me on there? Am I totaly out of luck? Thanks for the great recipes! I was able to print them out but not the grocery or ” how to put together” lists. Not sure why? I have ” liked” this site on FB. The how to put it together list doesn’t come up for me either. Could you email me the document as well? FYI – I went grocery shopping using the handy list from FB. The sweet onion isn’t listed on there at all (only the dried, minced onion)!!! Bummed that I have to figure out when to trek back to the store to pick up that one ingredient. Hopefully you can fix it quick before someone else runs into the same issue. Maneesha, thank you so much for letting me know, and I am so, SO sorry for the inconvenience! We fixed the printable so hopefully no one else will have that problem! I can’t believe how easy that was!! Taco Soup warming in the crock pot, can’t wait to try all 5 recipes! I would LOVE a vegetarian one too! Thanks! Yes! Please!!! I’m a vegetarian too. I make a lot of freezer chili. I also make mudajara and daal for the freezer. But I would love some fresh new ideas. Although there are so many different ways to prepare chili, and believe me I have tried so many different ones, I am getting a little tired of that being my go-to meal. 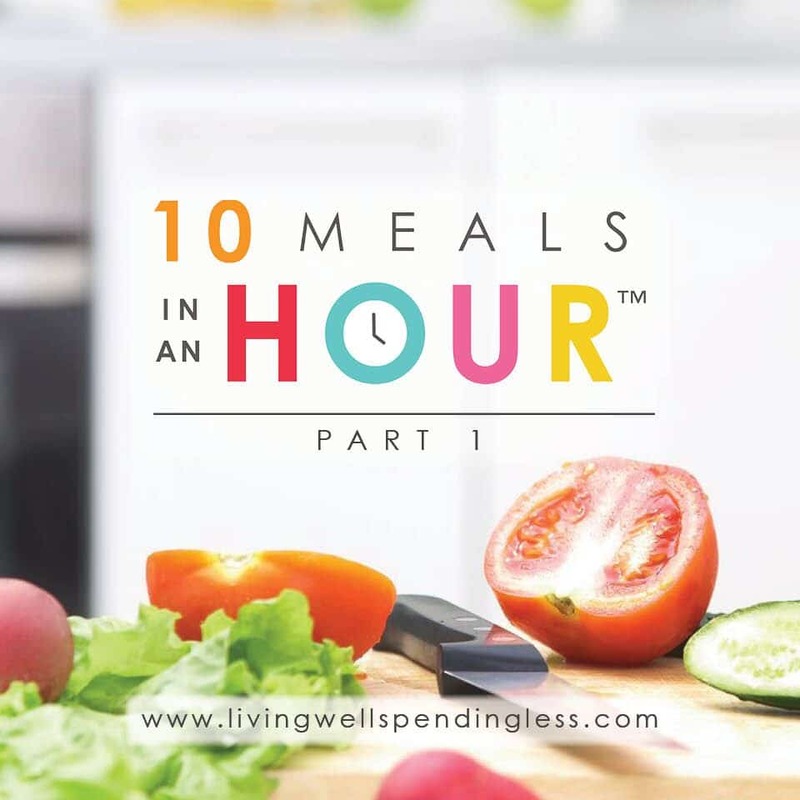 Just came across your blog today and love the 10 freezer meals in an hour. Really practical and helpful on those busy days we all have. I do not belong to facebook either and would appreciate you emailing me the necessary pages for fixing the meals. I see there are several others in the same situation. Maybe putting on the blog so it can be downloaded from there might be a help to you. Thank you in advance for these great recipes. Going to be busy in the next week or so. Can you suggest any easy vegetarian meals? Thank you so much for the step by step instructions and labels and shopping/prep list. I need things spelled out for me!! I am so excited to try these meals!!! I can’t get the shopping list or prep to print either, and I did like the fb page. Please email to me. Thanks bunches. I’ve noticed printing the labels is off by about a 1/4 of an inch. Am I the only one? Any tips or tricks? This happens on part 2 also. Thanks for making this so easy for the rest of us! This is the first freezer meal plan that included ALL meals that my family will actually eat. No seafood! My husband thanks you – my whole family thanks you! Yay! I’m so glad you all liked it Caryn! I cant get the instructions to come up. 🙁 the PDF just has the shopping list and prep/prepare. Can you email it to me? Thanks in advance for a great easy meal prep! 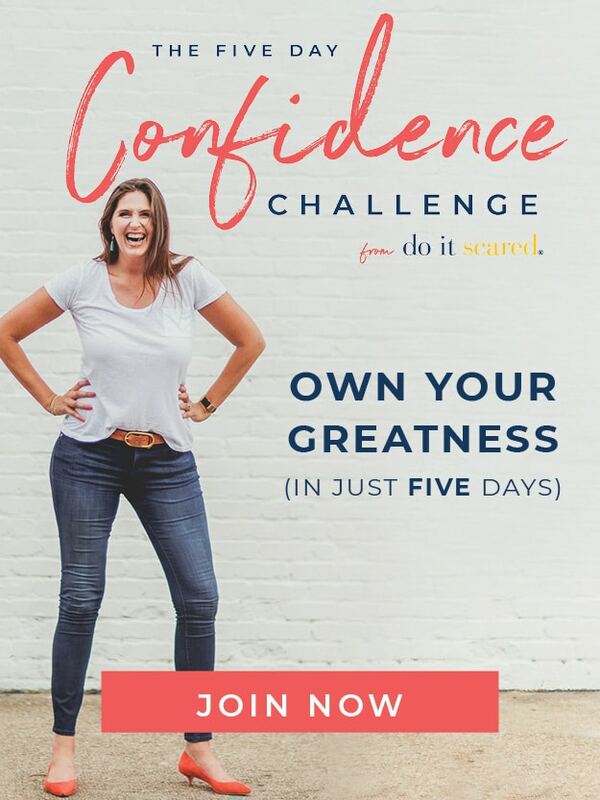 I can’t even read this blog all the way through — so so so excited! I am going to go to the grocery store tonight and cook this stuff tonight! Thank you so very much! This will make tax season so so much better. I almost want to cry from relief. Once again – thanks! Ruth I have been following your Facebook page for some time now and I have to say you are an inspiration. So happy to randomly have come across these tonight while doing a search…how did i miss this! I will be making part one and part two this week. I have a family of nine. Thanks for all you do. Thank you SO much! I made two of your freezer meal pages today for a total of 20 meals! taco soup for dinner tonight! I forwarded your page on to a military spouse facebook page because we are ALWAYS looking for easy meals and freezer meals! I tasted the sauces as I went and they were so good. This will be dinners and lunches for the next 20 days! THANK YOU AGAIN! This is great! However don’t you have fish and/or other seafood dishes? I like all of these recipes, but am not the cooking type so forgive my ignorance: Do each of these recipes get put into a crockpot when you’re ready to eat them? And for how long? Thank you so much for sharing, I have never done a freezer meal before. How long do they stay good for? Deciding when I need to start these! These look great! I just had a quick question…When I look at each of the 5 recipes do I need to double the amounts of each one to make it a total of 10 meals? Or is it already doubled to make a total of 10 meals? Just prepped all 5 recipes , cooking one for dinner tonight. Thought these were going to be whole meals, so a bit disappointed. However I have 4 lots of marinated meat and pots of taco soup in my freezer. The website was a bit slow but eventually I printed everything off. Loved having one shopping list done for me. Couldn’t get some things here in England (any ideas for when I need Hambeens?) but seem to have worked out well. Taco soup was good, just needed a bit more marinading. Next one should be delicious. Can’t wait to try some of the other recipe plans. I like all the info…but have a hard time printing it. can you make a print application easier? Do you have any suggestions for a red wine substitute? We don’t purchase alcohol–at all. 🙂 Thanks! Finally someone has some recipies that arent all chicken! I’ve liked the page on fb but am still having a hard time getting the pro tables, would you send them my way? Thanks! !